In this 4th part of this project we upgrade the software to give satellite data and frequency lock display. Plus the current frequency on the display is improved to give reading in MHz, KHz or Hz. When the GPS module starts receiving satellite data it provides a constant stream of data sentences which are know as NMEA sentences. Within this data stream the most important NMEA sentences include the GGA which provides the current Fix data, the RMC which provides the minimum GPS sentences information, and the GSA which provides the Satellite status data. In our project we will use the GGA data stream to extract the number of satellites detected and locked on to. We will be using the data highlighted above to show the number of satellite on our LCD. In order to extract this information we will set up a second Software Serial port. SoftwareSerial GPSreceiver (14,255); //14(A0) is RX on Arduino connected to GPS TX pin. //in void setup() include serial monitor command and set to 57600 baud. //The # key used to tell the unit to display the number of satellites on LCD. The software for this project is made up of three parts all of which are include in a download zip file. Now compile and upload the software to the Arduino nano on the main PCB. This project will use a small GPS module which has the u-blox Neo-7 GPS receiver. These modules are readily available on sites like eBay for around £12, they tend to be advertised for use with flight controllers on model aircraft. The u-blox receiver is normally fitted in the centre of a small PCB. Additional components on the PCB include a 3.3 volt Low Drop Voltage Regulator, timepulse and power on LED’s and EEPROM. There is also some short term back-up supply for the DRAM of the Neo-7 receiver by use of a 0.08F super capacitor (Seiko XH414HG). These capacitors normally only provide power off back-up for around a day or so if you are lucky. These GPS modules are usually configured by default to provide a 1Hz timing pulse output which is normally used to flash a green LED to indicate when the unit has a fix on satellites and the local oscillator is locked to the GPS signal. By default this timing pulse provides a 100mSec pulse every 1000mSec, as shown below. This timing pulse can be configured to provide different frequencies and different duty cycle and we will be using this option in this project to change the frequency and fix the duty cycle to 50%. GPS satellites are primarily used as a navigation system; this global positioning system can also used to disseminate precise time, time intervals, and frequency. The GPS carrier signals originate from an on-board atomic clock (oscillator) which is also monitored and controlled by ground stations in the United States to ensure it agrees with the Coordinated Universal Time (UTC). UTC is the primary time standard by which the world regulates clocks and time. Atomic clocks are based on the natural atomic oscillations of gases in resonant cavities. When isolated from magnetic fields, rubidium and cesium gases will resonate at specific frequencies under controlled conditions. These frequencies are so accurate that since 1967 the length of the second has been defined as the frequency of a specific resonant mode of the cesium atom, producing 9,192,631,770 oscillations in one second. The u-blox receiver uses a built-in 48MHz oscillator. Read my comments on youtube. The conclusion is that the mcu won’t output a clean clock without a PLL. 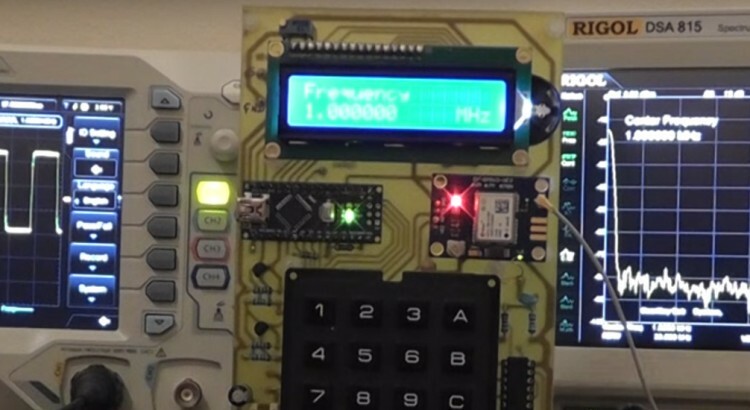 It can only output a signal synchronized with the 48 MHz clock and will add extra cycles from time to time to generate the right number of cycles ON AVERAGE but not on a single period. With frequencies that are low enough the problem is reduced (because changing the half period by +- 1/48000000 s is negligeable if the half cycle is 1/48000s) but will never disappear. I have found if you select any random frequency up to about 2 MHz the output always gives a nice clean square wave with no phase jitter. The output waveform of any frequency between 3 MHz to 4 MHz also stays fairly clean. Once you go higher than these frequencies the square wave has some phase noise but the frequency is still accurate when monitored on a frequency counter or spectrum analyser. Choosing frequencies which have a factor of 48 MHz like 4, 6, 8 or 12 MHz does show some slight improvement but the phase jitter on the waveform is still there. To remove this phase jitter altogether a Phase Locked Loop circuit could be used, but I will leave this for future project as it involves a second PCB with a Voltage Controlled Oscillator and a Programmable Frequency Divider in the feedback loop. The project as it stands at the moment does give out an accurate frequency reference signal so is still quite useful for the hobbyist and a good source of reference to check the accuracy of frequency counter. Thanks for all your helpful work on this project. Do you think you could give some advice on how to do the PLL circuit you suggested? It has been nearly a year and a half, and the PLL circuit is for me the most useful part of the project. I believe the issues you are seeing with “phase distortion” are rather due to the pulse dropping method that ublox uses for synthesis of frequencies that are not integer multiples of the 48 MHz crystal frequency. This means that 12,8,6,4,2,1 MHz etc. will be clean but 10 MHz etc. will not. Over an averaging period such as that used by a frequency counter the frequency will look spot on, but as you’ve demonstrated a spectrum analyzer and oscilloscope will notice the difference. What is the accuracy of the GPS reference ? Thank you for your videos and your excellent teaching skills !! I have compared it with my rubidium standard which would mean to within a few parts in 10 to the power 11. Where did you get your NEO module from ? Would you trust Ali-very-fast for those modules at very very low price ? Thanks for your projects and videos. Hi David, I purchased mine on eBay and had no problems. OK, thanks for your reply. I’ll give it a chance. Such a reference std has been on my to-do list for a couple of years. I happened upon your excellent video presentations and am encouraged to do something about it! Is it possible to send me a 1:1 image of the final PCB? Ideally a reversed image would be excellent since I routinely use the ‘iron-on’ method for producing my PCBs. I got it working, and I am very impressed. My previous reference was a 100KHz signal derived from Droitwich. It is interesting to compare the two (with your design producing 100KHz of course). There appear locked of course, but after several hours there was a relative phase shift of about a quarter of a cycle. Probably of no practical consequence but mildly interesting. It would be useful if the numeric keys were ignored until the “A” key is pushed. I have a habit of pushing a numeric button, and then remembering that I should have done an A first! Then, when the brain rights itself, using the A does not clear the junk already entered. So a nonsense frequency has to be sent before the process can be done properly. Secondly, and related to that, a possible use for the * key would be to erase anything previously entered, to fix a misstype! Nice project Louis. Thank you for it. I can see the Keyboard.H program but as I am not familiar with the Adruino I am not sure in which file it should be residing . can you help? I could not find version 5 so used version6. I can be contacted on 07974204219 or rileyr103nun@sky.com if you want any further details. Sorry for delay only just seen your message. This will be a zip file which will be saved in your download folder. You then need to install that library in your Arduino IDE. There are basically two ways of doing this. Below is a link to a You Tube video which describes both these methods. I would recommend you use the second method he explains as it is the simplest – it starts at 2.00 mins in to the video but I recommend you view the whole video first before doing it. 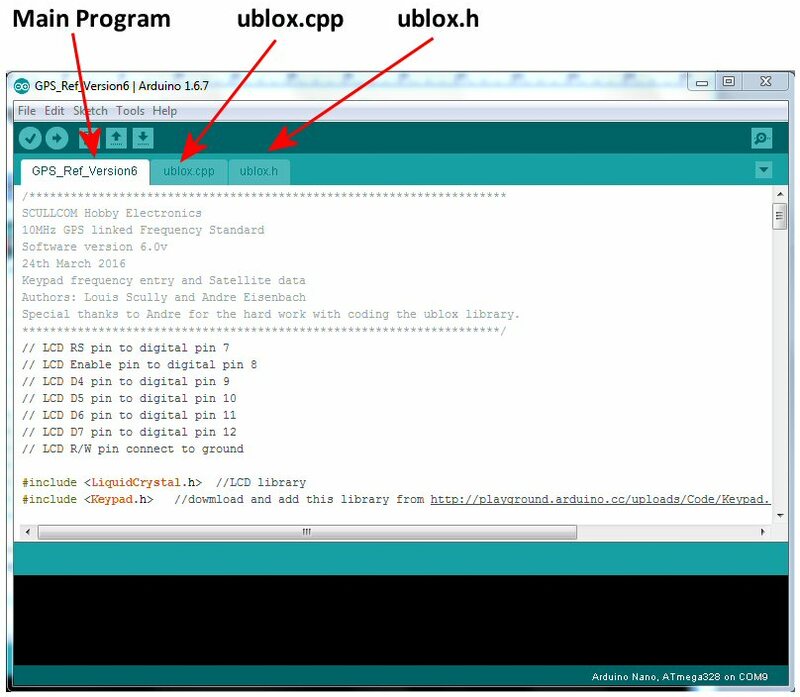 Once the library is installed you should be able to compile and upload the code. If you still have any issues then shut down the Arduino IDE software and then start the Arduino IDE again so it is reset – sometimes it needs to reset before the library is recognized. Please ignore my question about where the Keypad file had to go, having put it in manually I found out the correct (very simple) way to install it, so on to finishing the population of my board. Many thank for all yhe time and effort that it must take. It really is appreciated. how did you get the software to install on your arduino nano board .when i try to install the software i get a error (keypad.h no such file) could you please write back. I cannot remember the exact procedure, but I went to the Arduino site. How to install a library. Got rid of all the rubbish that I had tried to enter, followed the instructions and it went in without any problems. Good Luck it is well worth the effort. but it will let me up load arduous blink from the arduous library and it works I can make changes to the blink rate slower or faster no problem just can’t upload your software. plese write back. Glad to hear you got it working. Sometimes installing Arduino libraries can be an issue. Can you advise the part number of the keypad you use and the source; most of the membrane keypads I’ve seen on eBay are the stick-on type and I would prefer to mount via screws to a front-panel. The project is a bit slow-going here (too many actually !) but I did buy a keypad similar to your design but just as an aside; what exactly is the difference between a “keypad” and a “membrane keypad”? I naively imagined they would have the same pin-out….. but of course not !! I’ve decided that since the physics of my design are going to be substantially different to your layout that I might just as well use veroboard and do it the hard way. I have been following your excellent projects for some time now, and am in the process of building the DC Voltage Calibrator and the GPS locked Frequency Reference. Do you have available the Gerber production files for the GPS Freq Ref. project ? I downloaded them for the DC Calibrator and had the pcb commercially manufactured, but it has been some time since I made my own boards photographically. Maybe you could email them to me if available, or post them as a link. Keep up the fantastic projects and support videos. All the best – Kevin Pearce. I never received your email (you may have left out the “g” in the middle), but I have successfully downloaded the files from your links. I have ordered the PCB’s to be manufactured. Still needing enough time to assemble your DC voltage calibrator, but will get to that shortly. Thanks again for your very fast response, and my very best wishes for the future. I will remain “glued” to your channel for as long as it exists. I double check my email to you. I did use the correct email address, may be it is in your spam mail due to the fact that I added 2 zip files. Anyway as long as you have the files you wanted from my download links here. – Use of all 3.3 volt components, to reduce power usage and give better battery life. Care must be taken, when using this converter. The converter is not intended to power the DUT, from the limited laptop USB supply. DMM testing of the open positive pin (See Jumper) shows that it is the inverse voltage of the programming logic level… 5 volts on unused jumper/power pin, at 3.3v logic… 3.3 volts on unused jumper/power pin, at 5v logic. Meaning the use of the jumper is not intended to make power available, from the unused jumper pin. Therefore, the DUT/GPS needs its own power supply. I believe that, regardless of the DUT’s/GPS’s power source, the grounds need to be tied, to enable programming. The converter is tied to earth, through the laptop. I used my bench PSU and configured to it leave the ground floating. This setup worked well and I did not toast anything. If I were to do it again, I would order the bare receiver, without a passive antenna, as you need to order a powered antenna, anyway. That will save you a couple of dollars. Anyway, I listed the parts, because they all worked together, correctly, at the desired 3.3 volts. I know that this will be a very long-term project, for me. But, I will post updates and the final project, when completed. If anyone would like to work on this, with me, please reply. Maybe we can get Louis to forward our contact information, to each other, without posting it publicly. I seem to have lost the plot on what all the jumpers were intended for in this project; I can’t seem to find any past reference to the purpose of each one. For my application It looks like I can simply remove all the jumpers (ie short them all out)? Not entirely sure what JP4/5/6 are doing (i’m using a std keypad, not a membrane)? I am going to built this GPS frequency standard and I would like to avoid to use a back-up battery. as you said that “if a NEO-7N is purchased you do not need a back-up battery” I would like to use a NEO-7N (or a M8N) module. but looking at the pictures of the boards which use the 7N (and also M8N) I can see that the high value capacitor is still there! so what is its purpose? and what is the difference between a NEO-7N and a NEO-M8N? Recently i found this youtube channel an enjoy your way if explaning the projects. so is start with the GPS frequency standard. The GPS and arduio are bought recently. Question, do yoy sell the PCB ? I do not have the opportunity to make the PCB myself.